The sudden and unexpected death of Rabbi Shimon Gabai, 61, of Netanya has left his disciples and local residents bereft and in shock. 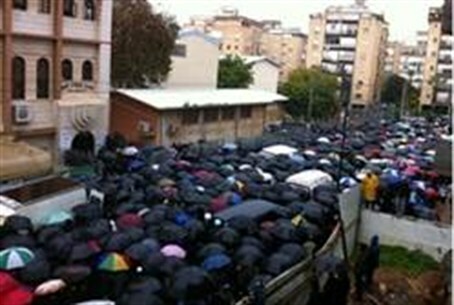 Inclement weather marked the funeral procession of of Rabbi Shimon Gabai in Netanya on Monday. Thousands came to pay their last respects to Rabbi who died suddenly at age 61. "I could not sleep because this is so difficult. The Rabbi's children asked that we organize the funeral because the arrangements had, quite naturally, not been made," Rabbi Pinhas said, noting how unexpected the death was. "We tried our utmost to honor the Rav's distinguished memory, may he be remembered for blessing," he added. Rabbi Pinhas related that 30 years ago Rabbi Gabai came to Netanya and began to provide religious services to the city's public. Rabbi Gabai, he recalled, was eloquent and had a rare mastery of difficult Jewish texts. His daily lectures were often attended by over 100 local residents, many of whom would not miss a life-restoring lesson from the rabbi. "Thanks to Rabbi Gabai many became proficient in Talmud and Jewish law, and were able to pass their learning on to their children in the tradition of our ancestors," Rabbi Pinhas said. "The Rabbi molded a generation of B'nei Torah [Torah disciples -ed.] in Netanya, who then spread out all over the country." "Over the years, Rabbi Gabai raised up thousands of students, and his loss has been deeply felt. We still haven't completely absorbed the news," he added. "Rabbi Gabai had a close friendship with Rabbi Ben Tzion Abba Shaul, of blessed memory, with whom he learned several times per week for hours on end. It was Rabbi Shaul who asked Rabbi Gabai to establish a Talmud Torah in Netanya – and it was in his friend’s name that Rabbi Gabai named Yeshivat Nahalat Shaul. "Rabbi Shaul came especially to show his support for our Yeshivah and to visit with Rabbi Gabai during his life," Rabbi Pinhas said. "His blessing brought many students knocking on our doors." "And now Rabbi Gabai's work has grown beyond the Yeshivah to over 800 foreign students in kindergartens and day care centers, as well as the Talmud Torah," he went on. "A decade ago we founded Nahalat Shmuel. Today the study hall has over 120 students." "Over the years our graduates have found their way into synagogues across the country, but still returned to Netanya to spend time with Rabbi Gabai. He preferred small intimate gatherings so he would host them in his home face-to-face," he added. "This is a very great void," he said. "We are still trying to understand our loss."